As some of you know, this blog was part of Eklund's "Next Great Blogger Contest" over at hockeybuzz. This was a very exciting opportunity for me, because normally my only chance to write for a site full of made-up nonsense is to comment on eyebeleaf's Mats Sundin posts. The contest got off to a rough start when it became clear that Eklund wasn't actually going to link to any of the blogs. This was a strange decision, since Eklund gets a billion hits a day and could afford to send some traffic to struggling no-names. On the other hand, it was an understandable decision because it was always possible that some immature malcontent could use the links to send subtle passive-aggressive messages, and that would be an unfair to a well-respected sports journalist like Eklund. The first few matchups seemed to go well, with decent participation from users and some strong entries from aspiring writers. Unfortunately the updates stopped without explanation, marking only the second time in history that something being driven by an Eklund came to a screeching halt1. As of today, the contest has been dormant for over a month and things don't look good. I don't want to say that this contest is destined to drag on forever without a satisfactory conclusion, but Eklund recently appointed Gordon Kirke to head it up. Anyways, a top secret source tells me that the contest is done (e4)2. And that's a shame. The hockey community deserves better. So in an effort to find a resolution that will please everyone, I've decided to declare a winner myself. Eklund says he had over 400 entries that he had to narrow down to a field of 64. So obviously, any of the 340 or so bloggers who didn't make the initial cut are eliminated. Sorry, losers. Of the 32 first round matchups, only 15 were ever completed. Those 15 matchup losers are out, so we're down to 49. Clearly you can't win the contest without even winning a single matchup. That would be ridiculous. So everyone who's matchup never got off the ground is out too. We're down to 15. There's really no fair way to narrow the field down to a final two, so we'll just have to go with first-come-first-served. Our Eklund Next Great Blogger Contest Final Two will be whichever bloggers happened to win the first two matchups. That ends up being a blogger named Kelly Faith and... whoa, hey, that would be me! Funny how that worked out. So we're down to a final two: Kelly vs. Down Goes Brown. How to determine a winner? Out of respect for his site, I think its only fair to do this the way Eklund would want it done. So, I kidnapped his dog and threw ping pong balls at it until it chose a winner. And he chose me! 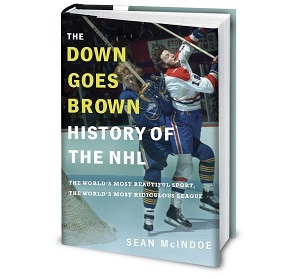 So... congratulations to Down Goes Brown, the 2008 Eklund Next Great Blogger Contest winner! The Down Goes Brown staff celebrate their victory. As part of my prize package, I will receive a homemade mix CD of folk rock classics and unlimited use of Howard Berger's fictional limo driver. Also, I'm going to keep Eklund's dog. He whines a lot and poops whenever somebody big comes near him, so I've named him McCabe. He whines a lot and poops whenever somebody big comes near him, so I've named him McCabe. This is a pretty good post, but did you just admit you read Eklund's site? I don't think you put too much effort into the E(x) ranking system. Could't you have used different kinds of animal feces..
Is a gerbil worse than a bull? Can we get a ruling?